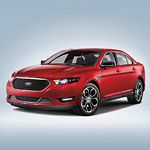 Ford Taurus Design Features to Highlight | Rhinebeck Ford Inc.
Another aspect of the exterior worth pointing out is the bold grill that it comes with, which gives it that rugged touch you know all Taurus' should have. It is the perfect overall look to drive around Rhinebeck or anywhere you choose to go. The vehicle also comes with intentional sculpted lines that allow the color of the car to pop just a little more. Rhinebeck Ford Inc. will be more than happy to go over the interior design features with you. The soft-to-the-touch materials that are embedded throughout the car will be pointed out. The design was made to look clean and refined, which definitely shows. It also features enough insulation to help isolate sounds from the outside and even from the engine. We are more than excited about the new Taurus, and we will be happy to share other design features you are interested in, so come on down, and take that test drive your itching to take.